If you want to see Lao Cultural performances than is the Royal Theatre in Luang Prabang a worthwhile destination on your Laos trip. Three times per week are a show of traditional Asian Dance with included the famous fingernail dance here at the Theater next to the national museum in LP in north Laos. 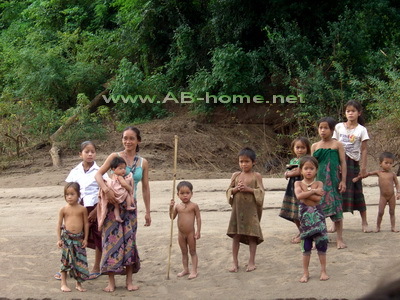 The Baasii ceremony is for many tourists a highlight of their holiday in South East Asia. 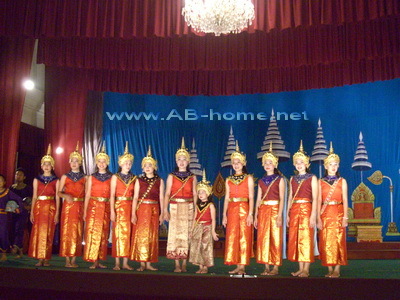 Traditional Folk by a live band emphasize the palak palam show here in Luang Prabang at the Royal Theater. The beautiful costumes of the actors fit to the performance of the Asian Saga. We saw a nice show and the admission fee of 8 to 20 USD is worthwhile. 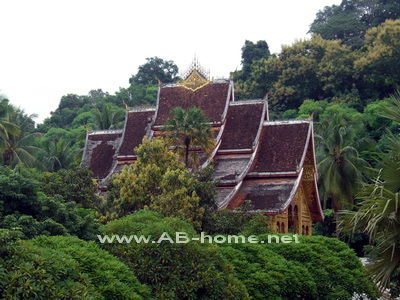 I can recommend a visit at the Theatre in Luang Prabang for all tourists who like to learn sth. 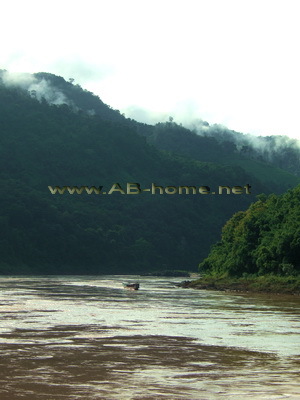 about the culture of Laos and for all who want to have a bit variety of temples and Mekong landscapes. Luang Prabangs most magnificent Buddhist Temple “Wat Xieng Thong” is located on the northern tip of the peninsula by the Nam Khan and the Mekong River. 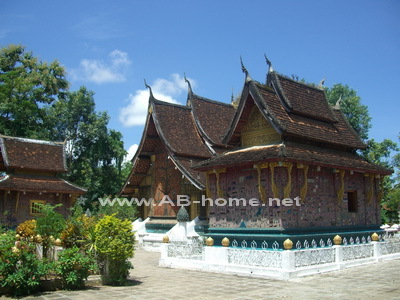 The order to build this historical monument in Laos gave King Setthathirat in 1560. A visit here at Wat Xieng Thong is really worthwhile because of the great temple reliefs, the beautiful architecture and the holy Buddha images in the chapel. The life tree mosaic on red ground of the wall from the ordination hall is really impressive and often photographed by tourists and believers. If you wake up early you can watch the monks how they clean the temple courtyard of the Xieng Thong Temple in the UNESCO Town Luang Prabang. The admission fee was in September 09 20000 Lao Kip. For us it was a highlight on our trip to LP in Laos and I can recommend a visit here at Wat Xieng Thong for all people who interested in historical and beautiful temples in Asia. 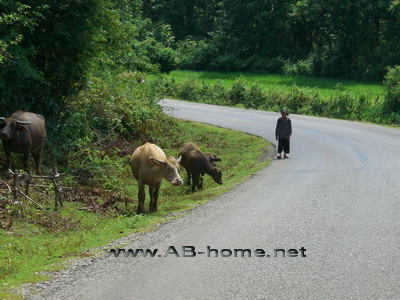 In September 2009 my wife and me was traveling from Chiang Mai in Thailand to Luang Prabang in Laos PDR. The minivan picked us at our guest house in CM up and brings us over Chiang Rai to Chiang Khong in north Thailand where we slept one night at the Namkhong guest house near the Mekong River. On the next day we took a ferry to Huay Xai to get our Visa for Laos, after some hours here in this cozy village our slow boat starts for the first day of our Mekong trip. 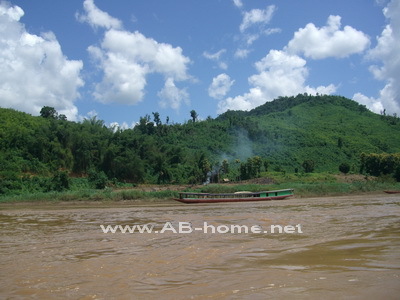 It was six hours on small wooden banks to Pak Beng in north Laos. 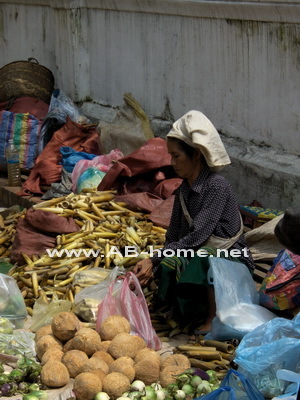 Here we took a walk in the evening through this small town direct on the Mekong bank in north Laos. 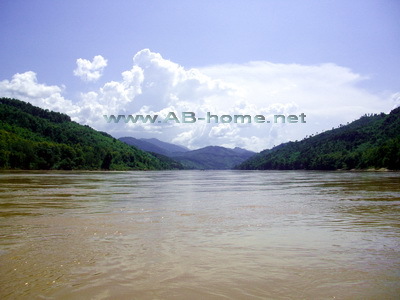 After one night at the Phetsokxai Hotel we took the second travel part: 7,5 hours from Pak Beng to Luang Prabang. On this day we just checked in the Vanechalearn Hostel and took dinner in a nice restaurant on the Mekong before we went to bed. Our Lonely Planet travel guide for Laos did a good job on this trip. The last days we spent in LP to explore this UNESCO listed city. We visited many temples and markets but our highlight was for sure the Tat Kuang Si waterfalls about 32 km out of LP town. From Luang Prabang we took a plane of Lao Airlines back to Chiang Mai in north Thailand. 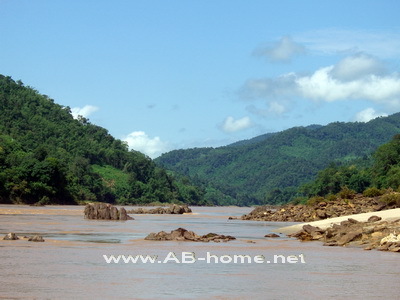 It was a good travel trip, especially the tour over the huge Mekong River. I really can recommend to do this if you have time on your backpack trip through South East Asia. The Lao airlines operates nearly every airport in Laos PDR with domestic and international flights to many destinations in Southeast Asia. 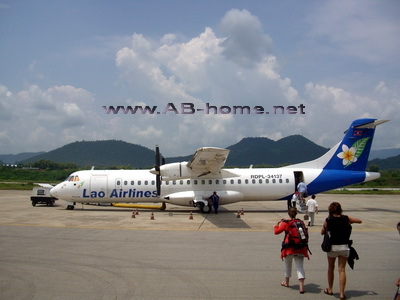 We flown from Luang Prabang in Laos to Chiang Mai in september 2009 with Lao Airline. The fee was about 100 USD. On board of the plane was enough space between the seat rows. The board service was friendly and helpful. The food was fresh and totally enough for a flight of 50 minutes, the service employees came two times for serve drinks. 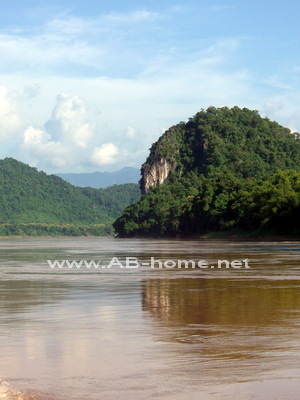 I will choose Lao Airline again for flights to Laos PDR. We enjoyed the traveling with this small but nice airline. 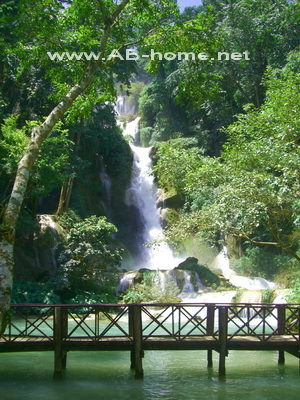 The Kuang Si Waterfalls are one of Luang Prabang’s main attractions. About 30 km out of town is the Tat Kuang Park. This park in Laos PDR is captivating with limestone formations, beautiful jungle pools for swimming and of course many nice waterfalls which splash through the national park. 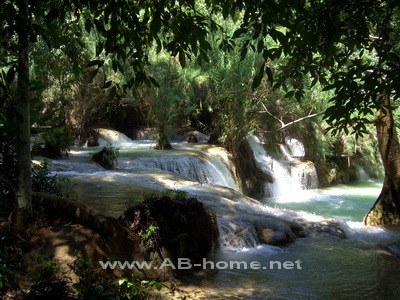 The waterfalls of Kuang Si are a nice day excursion from Luang Prabang in Laos PDR. From the center you can take a taxi for about 15000 Lao Kip or you go by motorbike. 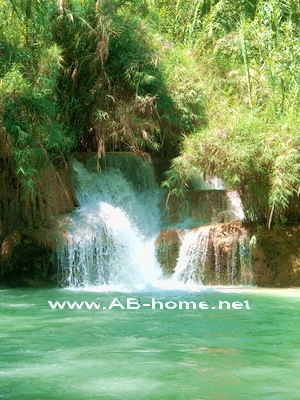 Take a fresh bath in one of Kuang Si's nature pools! For all who want to make sports at holiday is the bike a good option for a pleasure ride through the mountainous land of Laos Luang Prabang province. On the entry of the park are many shops where you can by drinks, souvenirs and lunch. 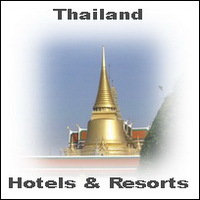 The Entry fee for this great spot in South East Asia is 20000 Kips which is equivalent to around 3-4 US dollar. Here you can find new Travel Reports and Photos of this blog.